Finland Takes Olympic Chill To The Next Level: Team Knitting : The Torch During the weekend's slopestyle competition, Finnish snowboarding coach Antti Koskinen was casually knitting at the top of the course. Finnish snowboard coach Antti Koskinen, who knits during competition, has become an Olympic folk hero. Finland has a tendency to beguile. Saunas are so important that both the president and prime minister keep official ones. The country has the most heavy metal bands per capita. It's experimenting with a basic income. Its language has no future tense. And in an unexpected moment during the weekend's Olympic slopestyle competition, the Nordic nation showed off another delightful quality: a passion for knitting. 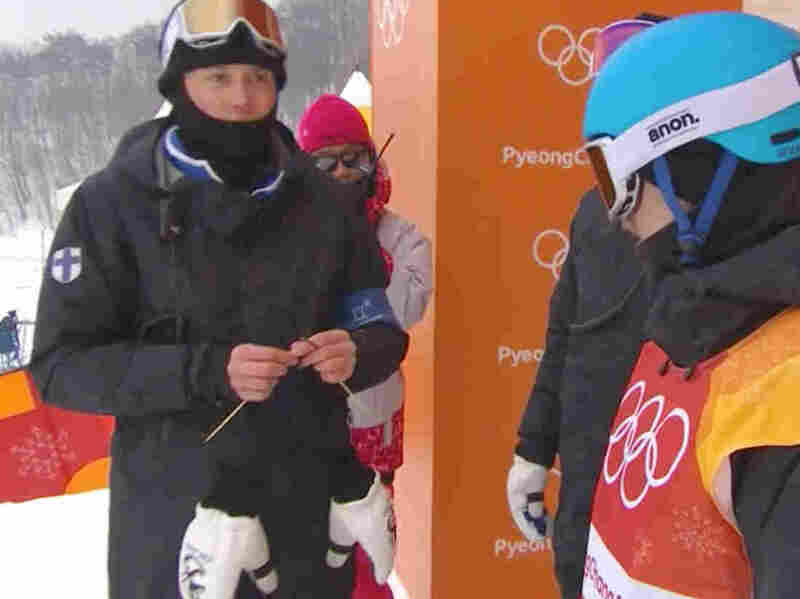 In a video on NBC's website, snowboarding coach Antti Koskinen is seen nonchalantly knitting at the top of the course while Finnish snowboarder Roope Tonteri gets ready to ride. Koskinen glances up from his project (something involving black yarn), passes the needles to one hand, and fist-bumps Tonteri. Then he goes back to knitting. People watching at home went wild for the contented crafter, and the feverish screen-grabbing began. "The Finnish coach is KNITTING at the top of the slopestyle course. Someone please find out what this man is making!!!" tweeted one Canadian fan. "This is lovely," replied one Canadian fan. "Will we get to see the blanket when it's completed?" "Of course!" the team answered, adding a little blue heart and the Finnish flag.